So you’re engaged. It’s crazy! Exciting! Emotional over-drive! You’ve had time to let the dust settle and you’re head is finally above the fog. And now must begin your wedding planning. Get your notebook out, pens, colored highlighters, your latptop, and browse away! Did you come to this page to browse through popular wedding ceremony and reception venues? You came to the right place! In no particular order, here are some wedding ceremony and reception venues and properties that are worth exploring, visiting, and are considered popular by many clients (I have photographed weddings at many of them). Please note that I was very intentional at curating a list of larger seating capacity venues (you won’t find small venues, restaurants, or churches in this list). Click on the venue name or image and the link will take you directly to each venue’s website for more information. Located in the heart of downtown Annapolis on State Circle, Historic Inns of Annapolis is a 250-year-old wedding venue that wears its age gracefully. A stately brick facade shrouds the elegant dining rooms that serve as wedding venues for couples with classic and traditional tastes. Old World carpeting, antique chandeliers, and Chiavari chairs add to the ambiance of Governor Calvert House, which is one of two event spaces at this venue. The Maryland Inn, the second event space, offers a cozier event room with a working fireplace, wine-colored drapery, and an 18th-century veranda. This venue can accommodate up to 250 wedding guests. If you’re searching for Annapolis wedding venues that overlook nearby Chesapeake Bay, Annapolis Waterfront Hotel is a beautiful option. With a maximum capacity of 250 wedding guests, plan a scenic bayside wedding ceremony before heading indoors to a tiled dance floor, trendy hanging greenery, and elegant furnishings for the reception. For many, United States Naval Academy is one of the most the quintessential Annapolis wedding venues. The Academy’s gorgeous Chapel is available for Catholic wedding ceremonies of Academy alumni, military staff, and faculty members. You may also be eligible to be married at the Academy if you are assigned to Naval Support Activity Annapolis as active-duty military or if you’re an active-duty military personnel living near the Chapel and attending regular services there. The Chapel is presided over by the Archdiocese for the Military Services, so there are additional requirements you’ll need to speak with the chaplain about before qualifying your right to marry in this space. A Georgian-style mansion with a ballroom that was once called the most beautiful in America, Historic Ogle Hall is full of colonial beauty and charm. Built in the 18th century, this wedding venue is a standing piece of Maryland history, having housed three governors and now being owned by the Naval Academy Alumni Association. As a venue, couples have seven distinct event spaces to choose from, including the aforementioned ballroom, which accommodates up to 40 people for a cozy reception. Larger reception spaces include the Courtyard, which can be tented or left open, and seats up to 140. Indoors, the beautifully appointed Historic Ogle Hall serves as a popular location for bridal portraits. The perfect setting to take in the beauty of the Chesapeake Bay and indulge in a few Maryland crabs, Annapolis Maritime Museum & Park is home to five event spaces for nautical couples. Ceremonies and receptions here take place with a 180-degree view of the Bay and Back Creek. Outdoor ceremonies are often held on the dock while outdoor wedding receptions on the main deck and piers can use a special tent with retractable, clear side walls — all the better to enjoy the view in cold or rainy weather. There’s also indoor space, including the 2,500-square-foot Bay Room, crafted in an industrial chic style and adorned with local maritime art. 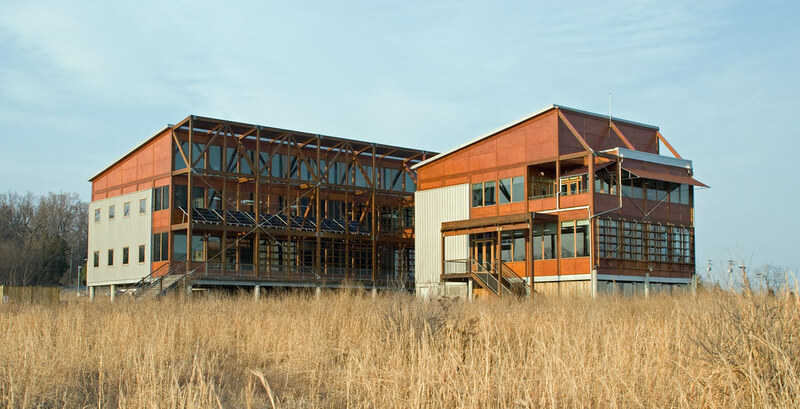 Nestled in a wooded area just off the beach, Chesapeake Bay Foundation’s Philip Merrill Environmental Center is as lovely as it is green. 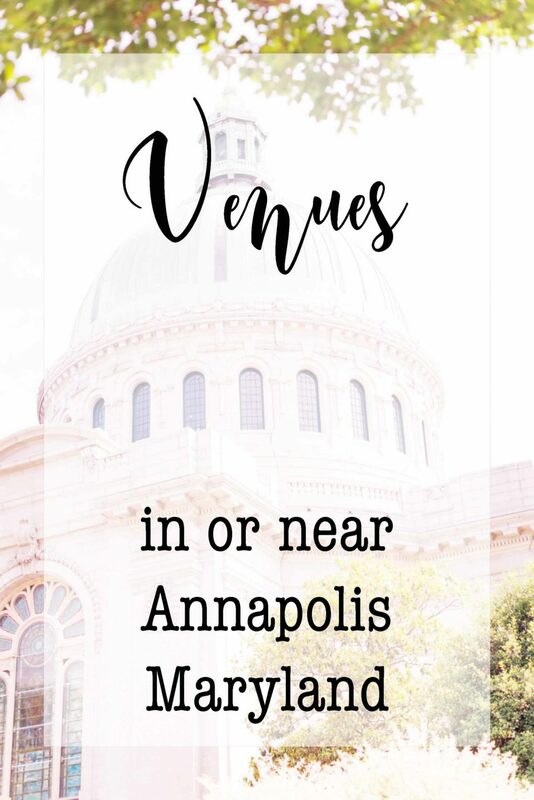 Constructed to offer breathtaking views of the Bay, this is the perfect event center for couples looking for Annapolis wedding venues a little further from the historic district. 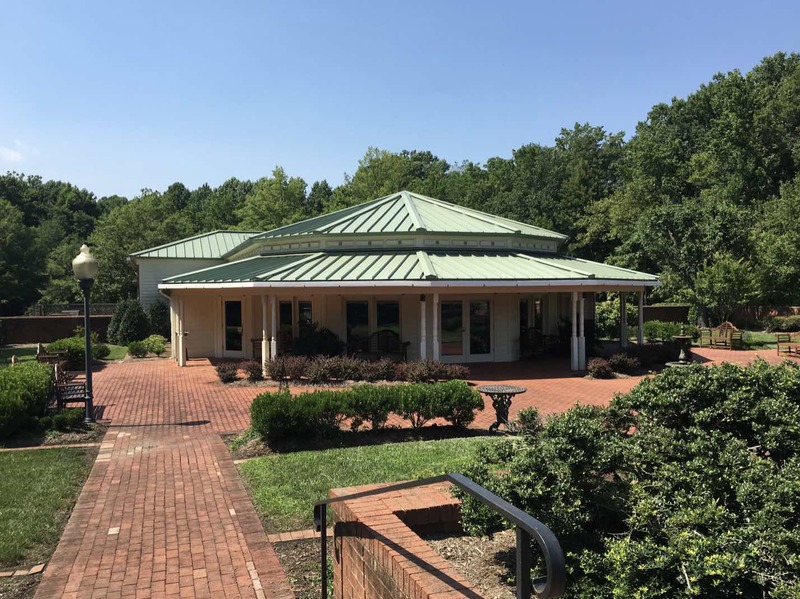 Still only a few minutes from downtown Annapolis, your wedding day here is convenient to the city, but you’ll have 33 acres of unspoiled nature to roam. Ceremonies are usually beachside, then the party moves indoors for lots of space to dance. Couples searching for romantic Annapolis wedding venues need look no further than The William Paca Garden and The Summerhouse, both part of Historic Annapolis. The two-acre garden is an authentic, reconstructed colonial garden, based on portraits and archaeological details of a 1772 Maryland garden. Beyond lush greenery, there are terraces full of plants that would have been available at that time, including parterres (plant beds in symmetrical patterns) for roses, holly, and boxwood plants. Little decor is needed with this venue, which hosts 150 standing and 120 seated guests. The brick Summerhouse is a gorgeous backdrop to the outdoor venue and can be used for small ceremonies of up to eight guests. Impress your guests with preparations that combine amazing flavors with exotic presentations and exceptional libations. The associates of the Crowne Plaza Annapolis drive to exceed your expectations and provide you and your guests with a beautiful setting. Upscale facilities include a 5,000 square foot Arundel Ballroom to accommodate up to 360 guests for a sit down reception/dinner; for groups of up to 150, the Queen Anne Ballroom, featuring a wall of windows, is the perfect change of scenery for your wedding; 196 guest rooms. 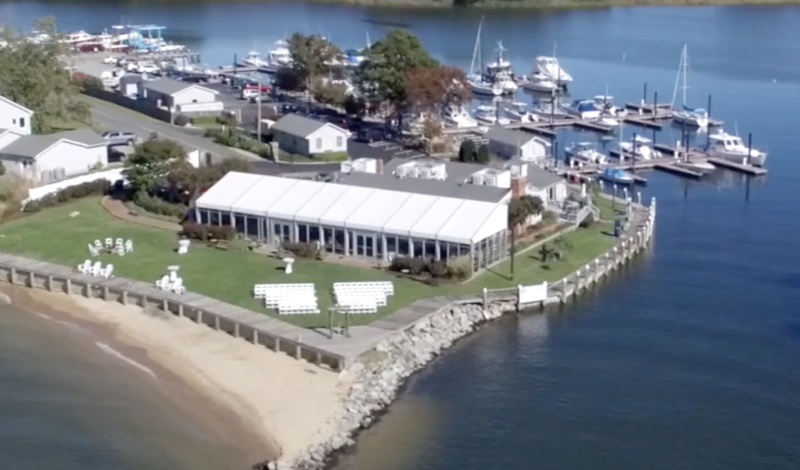 Chesapeake Bay Beach Club is a waterfront event venue based in Stevensville, Maryland. Featuring a hotel and the beach, couples have the accommodations of overnight stays and exceptional water views for their wedding. With five event spaces for clients to select from, indoors or outdoors, couples can host up to 350 guests at this venue. Located on the Marina Club Road, the Inn features a charming, bright and fresh atmosphere. They blend rustic charm and contemporary flair in their lovely décor and architecture. This venue also features a garden, boutique hotel, a farm-to-table restaurant and a spa. A waterfront wedding venue in Stevensville, Maryland, Silver Swan Bayside provides couples an unparalleled backdrop in which to celebrate their knot-tying affair. Its spectacular natural setting combines quiet sophistication with exquisite views of the Chesapeake Bay. Inviting you and your significant other to be as creative as you choose, Silver Swan Bayside’s professional staff makes planning your special day a fun and exciting experience! A stunning outdoor venue, Silver Swan Bayside features a private beach, beautiful gardens and tented oversized pavilion. Couples interested in a formal seated event may comfortably host up to 200 guests, while those interested in a more casual cocktail-themed affair may accommodate a maximum of 230. The Club At South River offers unique spaces set amidst a lush scenic backdrop. Capture your special moments with endless photo opportunities inside the Clubhouse and around this exceptional venue. Exceptional fare, thoughtful presentation and gracious service are all trademarks of this gorgeous venue located just minutes from Annapolis. The Adirondack Room is a gorgeous room for dinner & dancing that accommodates up to 100 guests with a Dance Floor or 120 guests with a Dance Floor in the adjoining Bistro. The Adirondack Room is an ideal location for an indoor Ceremony in the Winter months. The Bistro is a warm space that can be utilized for Cocktail Hour, Dancing, Late Night Food Stations and can be used in conjunction with the Adirondack Room for maximum Club capacity of 150. The Pavilion is a beautiful, natural setting for an Outdoor Ceremony. 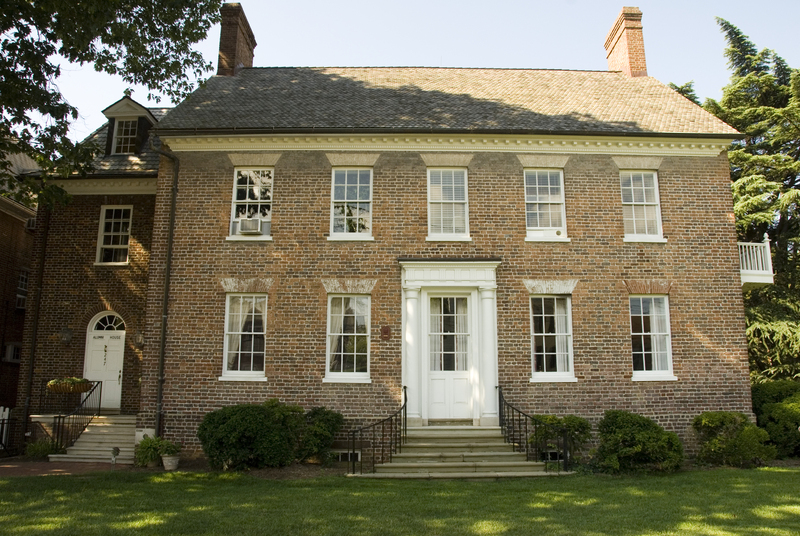 Historic London Town and Gardens is a historic venue located in Edgewater, Maryland. Talk about standing the test of time! This venue has been hosting events for over 330 years, offering unparalleled service and memorable events to all of their clients. Accommodating up to 280 guests, this venue features waterfront views, luscious gardens with fresh and year-round flowers, and a romantic ambiance. Resting along the sparkling South River, any wedding will have the most scenic backdrops! Quiet Waters Park has a choice of three beautiful settings for you to hold your wedding ceremony. The South River Overlook is wonderful, with two small gazebos perched just above the scenic South River. Up to 75 guests can enjoy your ceremony at the Overlook. The James Lighthizer gazebo is a lovely setting, with a large gazebo located on the edge of a serene pond. The Lighthizer gazebo can accommodate up to 35 guests. The Blue Heron Center is the perfect location to hold both your ceremony and reception. Inside you will find vaulted ceilings, large windows, and a wooden dance floor. Outside there is a spacious brick patio and a gorgeous, well-kept garden with a three tier fountain. The Blue Heron center holds 150 people seated. Since 2015, Whitehall has been available, on a limited basis, for weddings and corporate events. Making it once again, the place to entertain. This secluded mansion commands magnificent views of the Chesapeake Bay. The grounds consist of 135 acres of sprawling lawns and fields, bordered by two creeks and Whitehall Bay. 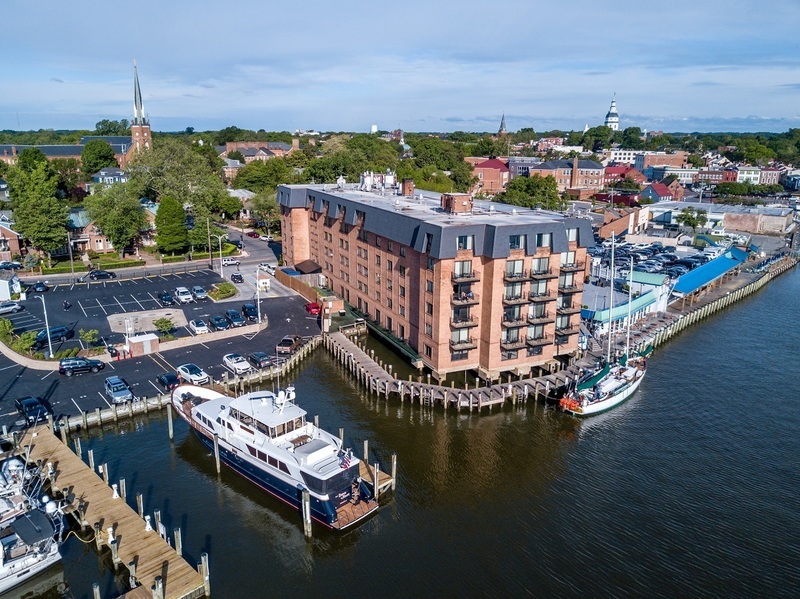 Whitehall is 15 to 20 minutes from downtown Annapolis by car or by boat and offers many locations to hold your wedding, your wedding reception, or your corporate event. The venue holds a maximum guest head count of about 300, and onsite parking for at least 700 cars. This Maryland venue is elegant and private, with a coastal appearance in its pale blue exterior and bright white walls inside. Couples can find this venue on the waterfront of the Chesapeake Bay, 20 minutes from downtown Annapolis. This venue has two options for couples on their big day. These separate wedding venues are both right on the water of the bay. The first is the Herrington Yacht Club, with gardens, ballrooms and a harborside patio. The maximum capacity for the yacht club is 170 guests. The other option is the Paradise Ballroom. This private coastal setting offers a pier, colorful gardens and a tent structure to welcome up to 300 guests for a couple’s wedding. The tent features carpet, a chandelier and lighted ceiling drapes as a classy option for the reception. Throughout these venue spaces couples will find waterfront ceremony locations such as pergolas and gazebos, as well as two-story indoor ballrooms with hardwood floors, many windows for natural light and white accents to keep the space bright and open. 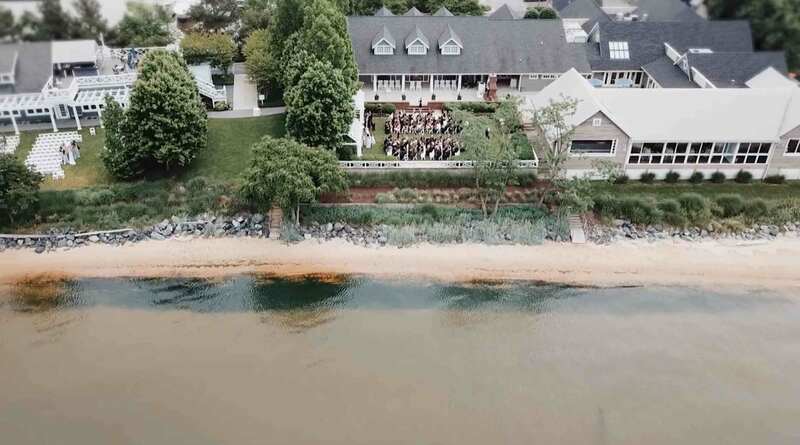 If a classic venue with lush outdoor views on the coast is the wedding you’re after, consider Prospect Bay Country Club in Grasonville, Maryland. Prospect Bay Country Club is a hidden gem with expansive views every way you turn. From the vibrant and green manicured landscape to the waters of the Chesapeake Bay, Prospect Bay Country Club has everything couples could want for their ideal wedding day location. Couples may host up to 230 wedding guests within Prospect Bay’s two event spaces. There are two outdoor spaces perfect for ceremonies, while the roomy banquet hall is perfect for a reception and cocktail hour. Prospect Bay has earned multiple Couple’s Choice Awards from WeddingWire. 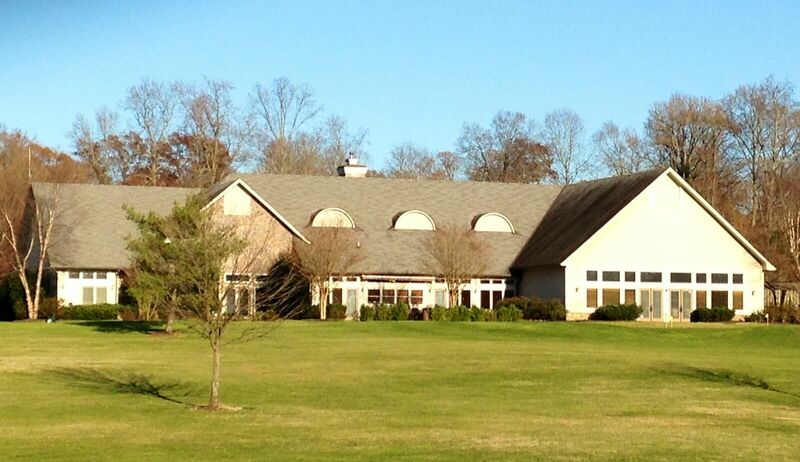 Prospect Bay Country Club is located on Maryland’s Eastern Shore in Grasonville. Renditions is conveniently located just minutes from Washington, D.C., Baltimore and Annapolis. It is the perfect place to host your wedding ceremony and reception, overlooking the beautifully landscaped golf course with plenty of free and convenient parking. The graciously appointed clubhouse offers the Champions Room, seating up to 175 guests, along with the Players Grill which can accommodate an additional 60 guests (based on availability and time of season). Thank you so much for visiting this page on my website! 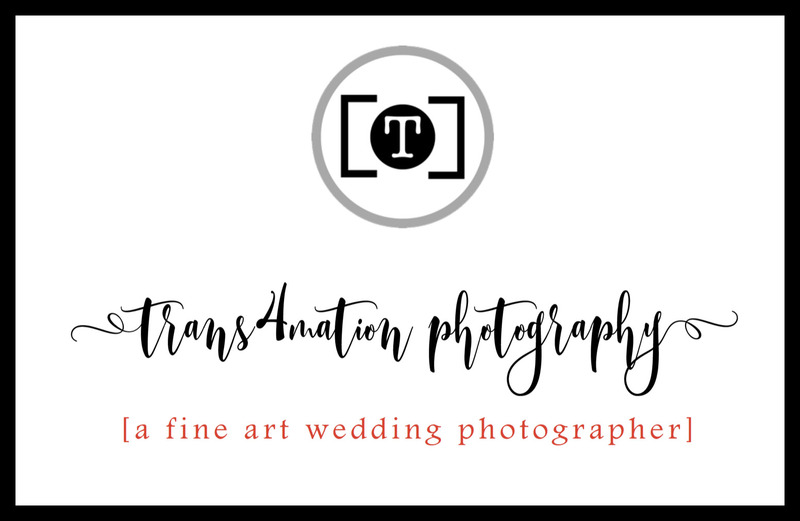 Once you’ve nailed down a wedding venue location and date (signed a contract with the property), please contact me to begin the conversation about wedding photography. And just to tickle and whet your appetite, check out my Informational Booklet I’ve prepared for engaged couples just like you! * NOTE: This specific “Venues” blog is for informational purposes only and by no means is it an endorsement. You reserve venues, properties, and other vendors, services, and contractors at your own risk and it is recommended that you perform sufficient due diligence in your research and consult professionals before signing a contract. Also, please note that some of these photos on this “Venues” blog are not my own. The original owner, often the venue itself, retains the copyright, or the images are in the public domain.